As a child, Corinne Touzet dreamed of becoming a clown. After she finished school she toured the USA and Canada and had the chance to stay in an indian reservation for a time. When she returned to France she studied three years being a clown and very successfully played in street theater's. She studied theater and received a certificate for actresses. Years later she went to Paris where she had for a few months her own theater show called "Femme Clown". In 1981 she auditiones for the leading role of Marianne, Juliette Benzoni's second very successful book series. She has played in many tv-productions, movies and has traveled as far as Russia. She acted in many international film production While playing "Marianne" Corinne learned to do her stunts - something which came in useful when she was offered the role of "Isabelle Florent" in "Une femme d'honneur" playing a police officer. Her director at the beginning, was none other than the ingenious Marion Sarraut - who has directed four of Juliette Benzoni's beloved books series. To the Catherine fans, the lovely Corinne Touzet is well remembered as the beautiful, but blood-thirsty Princess Zobeïda of Granada. As we learn from her interview to the catherine de montsalvy fansite, it was a great challenge for Miss Corinne, to play after the lovable and warm heroine Marianne, such a complexe character. I present to you my report attenting Corinne Touzet's play in Paris directed by our marvelous Marion Sarraut. While I had been attending the launching of the first "fanclub" of Laurent le Doyen in Paris, 9.5.2010 I went to see the play of Corinne Touzet PERSONNE n'est PARFAIT. It was an unforgettable afternoon, a marvelous play with fantastic actors. Lot's of laughter and an audience never wanting to end with applauding at the end! 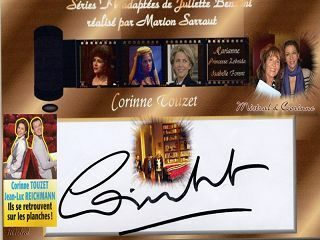 I would like to thank beautiful Corinne Touzet, for signing my card and for taking the time to pose for a photo with me. The "waiting-line" was incrediable long, for fans to get their dedication, even more so do I appreciate this special moment with the star of "Marianne" and of "Catherine" (Princess Zobeïda) thank you very much dear Corinne. As a rule, I never link to anyone's website, without asking for their permission ! I am very happy to annouce, that I have now the official approvement of the webmistress of "Corinne Touzet's" official beautiful website. I confess, I am very proud to have this honor, thank you Emilie. To know more of the beautiful see → Corinne Touzet click on her name.